It is with a thankful heart that I would like to take this time to express how much I appreciate our members of Women of Quail Creek. 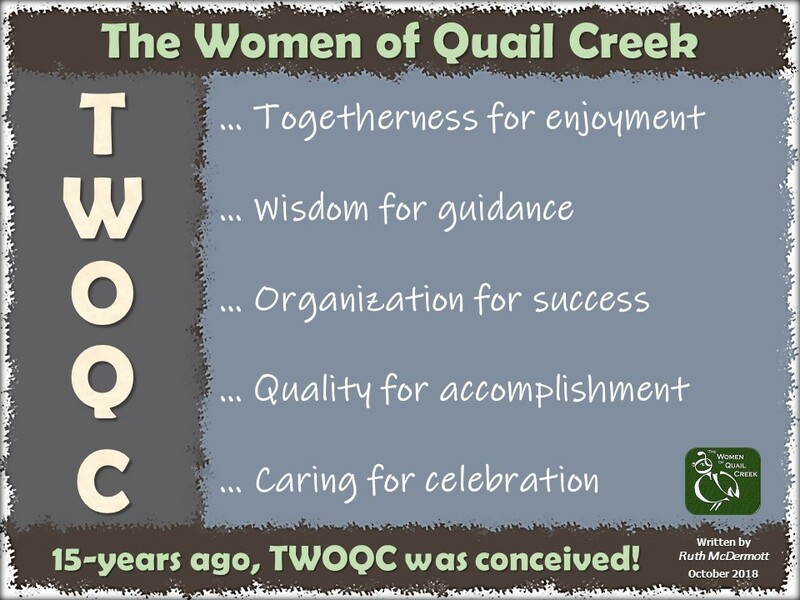 TWOQC members are the most caring, loving, helpful, thoughtful and selfless women I have had the opportunity to volunteer with. Thank you so much for all that you do and for volunteering in many different ways. Your actions are priceless! My wishes go out to each of you for a safe and wonderful Thanksgiving. A sincere thank you to Julie Daines, Air Force veteran and TWOQC member for laying The Women of Quail Creek wreath on Veteran’s Day at the Green Valley Cemetery service. Peggy McGee and Carol Mutter were there for support. TWOQC loves and appreciates all veterans. The Continental School Jazz Band and Chamber Orchestra will provide entertainment for the Holiday Luncheon Monday, December 11, 2017. We are truly privileged to be able to enjoy the efforts of these talented local youth making beautiful music. Come and enjoy the festive holiday season music. A few single tables are still available for the Holiday Luncheon. If you have plans to attend, please get your seats now. Final sales of seats for the Luncheon will be December 4th. Raffle ticket sales for the gingerbread man centerpieces have started (cookies not included). You may purchase your tickets from Carol Mutter at $1.00 per ticket or 6 tickets for $5.00. The final sale of raffle tickets will be the day of the luncheon on December 11th prior to the start of the luncheon. You may contact Carol at president@womenqc.com. Holiday luncheon: Roasted turkey breast with mashed potatoes (gravy served on both the turkey and the potatoes), cranberry walnut dressing, homemade cranberry sauce will be on the table, and rolls & butter. Dessert will be Gingerbread cookies with icing and red & green sprinkles. RENEW YOUR DUES… or join TWOQC if you are not a member! 2018 applications for new members and renewals for current members will be available at the December luncheon or you may go directly to the website to complete the form. You may bring your renewal to the holiday luncheon or mail it to Angie Werner at 1924 E. Orinda Lane, Green Valley (85614). If you want to sponsor a student from Youth On Their Own for the holidays and haven’t yet picked up a name you may get one from the box by Diane Quinn’s front door at 2276 E Skywalker Way. Completed gift bags should be brought to the December 11 Holiday luncheon or taken to Diane’s house before Dec 10. Complete instructions are included with each holiday card. For more information contact Diane at yoto@womenqc.com. Recently a veteran became homeless when a fire destroyed their home. Fortunately, no one was injured but the family got out with only the clothes on their backs. We donated some clothing. They have moved into a temporary home but have some needs to get re-established. If you are interested in helping with further donations, please view THIS LIST. If you can help with any of these items, you may drop them at Peggy’s house on Monday, November 27 and she will get them to the VA. If you have questions, please contact Peggy at pastpresident@womenqc.com. Remember the next meeting is on December 6th, 10:00 to 11:30 at the Kino Conference Room. We already have seven moms signed up. Bring your ideas with you! Unfortunately the totes and glasses did not arrive as anticipated. They are now scheduled for delivery on December 4th in the late afternoon. If you pre-ordered either item, you will be notified when they arrive. FASHION SHOW (February 7, 2018): Please consider volunteering to sell 50/50 raffle tickets. Two people would be ideal. Responsibilities would be to sell tickets before and during the fashion show and to account for all funds collected. If you are interested in volunteering, please contact Carol Shelton at fashionshow@womenqc.com. We received a nice thank you note from the Veteran’s Golf Association for donating some logo items for a raffle basket at their recent fund raiser. For the past several years, the group has donated $500 towards our Baby Shower for the Air National Guard. Thank you, VGA.